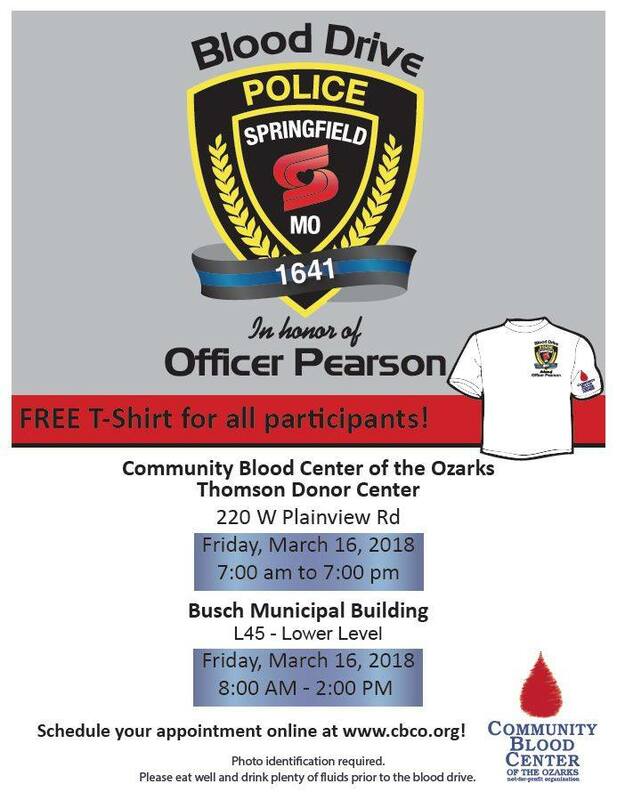 Come show your support for local law enforcement at our Blood Drive in Honor of Aaron Pearson! This event takes place only at CBCO’s Thomson Donor Center in Springfield, Missouri, on Friday, March 16, 2018, from 7:00 a.m. to 7:00 p.m. All participants will receive a T-shirt designed for this event. Officer Pearson was on duty with the Springfield Police Department when he was shot in the head January 26, 2015. He was rushed to Mercy Hospital where he underwent emergency surgery. Twenty units of blood were necessary during surgery. The blood was available thanks to generous CBCO donors. You can make a difference in someone’s life, just like those 20 donors made a difference for an injured young father, husband, and law enforcement officer. Read Aaron’s story by clicking HERE. Make an appointment to donate blood during this event by clicking HERE. Want to save time at the blood drive? Use our new QuickPass! Use your smartphone, tablet, or computer to complete questions and then skip the registration desk when you arrive. Remember, QuickPass must be completed the same day as the blood drive. Get started by clicking HERE.